We received three beautiful framed prints recently, and although they tickled something in the back of everyone’s brain, no one in the group of assembled family and friends was able to recognize them with certainty. Naturally I brought them to the library, certain that the librarians in the Children’s department would know. No one recognized them right away, and an image search on the Internet was also fruitless. 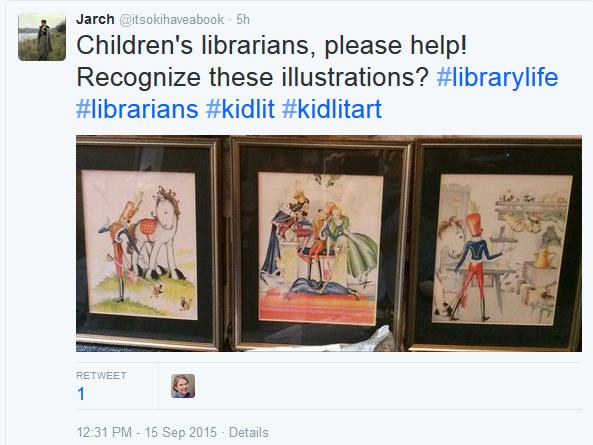 I turned to Twitter, choosing a few tags (#librarylife, #librarians, #kidlit, #kidlitart) and also sending a tweet directly to Mel of Mel’s Desk, who kindly re-tweeted to her many followers, a good percentage of which must be children’s librarians. In a matter of minutes, I had my answer: not The Steadfast Tin Soldier by Hans Christian Anderson, but Get-A-Way and Hary Janos by Maud and Miska Petersham. According to WorldCat, this is “The story of a worn out toy horse and his friend, a wooden soldier doll, who travel to a land where old toys become new.” I requested it from WorldCat, since there isn’t a copy in my library system. I’m glad that (a) I have an answer to my mystery, (b) the Internet can’t answer everything, and (c) librarians are awesome detectives. That is awesome. I’m glad you got an answer and those are some really neat little paintings. I like them. Where did you find these? Maud and Miska Petersham are my great-grandparents and I would love to know where these prints came from. We have many prints but I have to say these are not among them. Your great-grandparents, how cool! I’m not sure where these are from; I received them as a gift.